Tottenham Hotspurs vs Manchester City, Champions League Quarter-Final Live Streaming Online: How to Get UEFA CL 2018–19 Leg 1 Match Live Telecast on TV & Free Football Score Updates in Indian Time? Sergio Aguero who has missed the last two games for City is a major doubt for the trip to London and if he misses again, his deputy Gabriel Jesus should start. The Brazilian striker has done well in the absence of Aguero and scored the only goal of the FA Cup semi-final victory over Brighton. Kyle Walker’s hamstring issue could sideline him along with another full-back Oleksandr Zinchenko who misses out through a thigh injury. Tottenham could trouble veteran defender Vincente Kompany with pace as he is past his prime. There are no issues in the midfield though with Kevin De Bruyne, Fernandinho and David Silva certain to make the playing eleven. Toby Alderweireld and Jan Vetonghen will form the defensive partnership for the hosts who will be wary of City’s exquisite passing. Moussa Sissoko is a workhorse in midfield, and his industry will well determine how much influence key playmaker Christian Eriksen has on the game. Harry Kane and Son Heung-Min don’t quite enjoy playing against Manchester City, but that will need to change as Spurs need goals tonight. One man who can have huge influence on tonight’s tie is Danny Rose who is most likely to play as an attacker against City. When is Tottenham Hotspurs vs Manchester City, Champions League 2018-19 Quarter-Final Leg 1 Football Match Schedule (Date, Time and Venue Details)? It is going to be another exciting late-night match for football fans in India as Tottenham Hotspurs and Manchester City face-off in UEFA Champions League quarter-final Leg 1 of 2 on April 9, 2019, at 12:30 am IST (Wednesday midnight). Tottenham Hotspurs vs Manchester City football match will be held at Tottenham Hotspur Stadium in London, England. 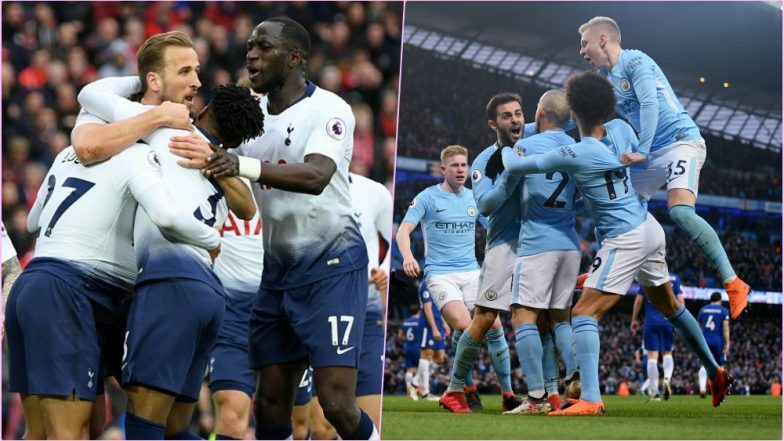 How to Watch Live Telecast of Tottenham Hotspurs vs Manchester City, Champions League 2018-19 Quarter-Final Leg 1 Football Match? The round of eight contest between Tottenham Hotspurs and Manchester City, makes an exciting contest in UEFA Champions League. The live telecast of Tottenham Hotspurs vs Manchester City will be done on Sony Ten 1, Sony Ten 2, or Sony ESPN channels. Where to Get Free Live Streaming Online of Tottenham Hotspurs vs Manchester City, Champions League 2018-19 Quarter-Final Leg 1 Football Match? With Sony Sports Network as the official broadcaster, their digital platform Sony Liv will be providing the free video streaming. You can catch Tottenham Hotspurs vs Manchester City, tie of UEFA Champions League with free live streaming online on Sony Liv. Live score updates of Tottenham Hotspurs vs Manchester City, will be available on LatestLY here. Tottenham Hotspurs will be cautious of Manchester City in the opening few minutes, but once they settle down, they can test their opposition. A scored draw is the most likely result from the first leg.